Is there reason to buy new vinyl? Is there any reason not to just stream an album, and never to feel that physical artifact, born from the blood, sweat, and tears of so many, working so hard, to bring to life? 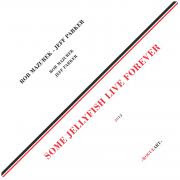 Holding guitarist Jeff Parker and Cornetist Rob Mazurek's vinyl only Some Jellyfish Live Forever, I have the gatefold open in my hands and am reading Alain Drouot's no-nonsense liner notes. Referencing the duo's associations through the years in several Chicago based groups and then delving into the subject of immortal jellyfish, it is pure joy. I had first heard about this recording last year from Mazurek and had been looking forward to it since. And, I'm not disappointed. Mazurek is all acoustic, leaving behind the electronics that have permeated a significant body of his work, and while Parker's guitar is fed through various effects, his sound and approach never overpower. The two blend nicely, creating a series of soundscapes in which the guitar lays the ground work while Mazurek delivers lovely austere melodies. What a pleasure to stop and listen to this album - the sound so organic and textural. It moves slowly, slyly, without hurry. The duo's music still tingles in my ear as the record runs out and the non-automatic tone arm of my record player delivers a pop as sure as a breath. As I put down the big white album jacket, after reading the liner notes and checking out the photos, a small download card tumbles out. I look at it - is it worth it? Available at Downtown Music Gallery. At the risk of oversimplification, those committed to vinyl fall into three broad categories: those who believe analogue still affords superior sound quality to any digital media; those who enjoy a bit of nostalgia and take pleasure in the manual process of vinyl replay (personally, something I’ve never missed); and those who want to own something relatively exclusive – like people who collect first editions of books – or more mundanely, to appear cool in having something their friends don't have; as one commentator put it: a cult, like speaking Klingon. Of course, they can fall into more than one category. There's also a fourth – those who purchase a vinyl release because it's not available in any other format – but that's not really a commitment to vinyl, rather a recognition that there's no other choice if you want to hear the album. As to the ratio of each, I've a sneaking suspicion that for free jazz/improv audiences, the third and fourth are the largest. As for me, I'm a bit of the first, a lot of the fourth and occasionally, when the packaging and presentation warrant, the third.